Warming Up: Chicken & Artichokes! | Delicious! Delicious! Warming Up: Chicken & Artichokes! The cast iron skillet is back in use as chicken breasts sizzle and pop to a golden brown in olive oil. Caryn is half engulfed in a low cabinet, rooting for something that doesn’t seem to be there. With all her CLANGING, she doesn’t see Hank enter, dressed in swim trunks. He swings a towel over his bare shoulder. Caryn bolts up to a standing position, her head colliding violently with an open cabinet door. He reaches out to her but she brushes off the pain with a smile, the model of professionalism. Yeah. What can I do for you? She opens a can of artichoke hearts. Hank looks in the fridge. I’m just getting a soda. Isn’t it a little chilly for sun bathing? She pulls her wool cardigan closed as she drains the artichokes in the sink. You boys seemed to get plenty of sun while sailing around the world for a month. Hank examines the tan line around his waist. Nah. I could use a little more. Caryn focuses on a pot of wild rice simmering on the stove. Hank sneaks a peak. I’m starved. Can I taste? He tries to take the spoon from her, but she playfully smacks his hand away. I’m trying to work here. Hank laughs and rests against the counter to watch her stir the rice. Twenty Hollywood types cruising around on that boat and not one of them could cook. We sure missed you. Well, I can’t say I missed you poking around the kitchen all the time. She returns to her search in the cabinet. Hank steals a sliced mushroom from a bowl and heads to the door. Alright, kiddo. Call me when lunch is ready. Caryn watches him leave. As the door swings closed, she can’t help snickering to herself…just a little. This is an old recipe from Cooking Light that I’ve adapted over the years. Satisfying on a chilly day. 1. Preheat oven to 375 degrees. Prepare rice according to package directions. Spoon into 13×9-inch baking pan. 2. Dusk chicken breasts with salt, pepper and paprika. Heat butter and olive oil in large non-stick skillet over medium-high heat until butter is melted. Add chicken and cook unti lightly browned, about 3 minutes each side. Remove from skillet. 3. Add mushrooms to skillet and saute until mushrooms release their moisture and moisture mostly evaporates, about 5 minutes. Whisk together flour, broth and sherry until combined. Add liquid and rosemary to mushrooms in skillet. Stirring constantly, cook until sauce is thickened, about 3 minutes. 4. 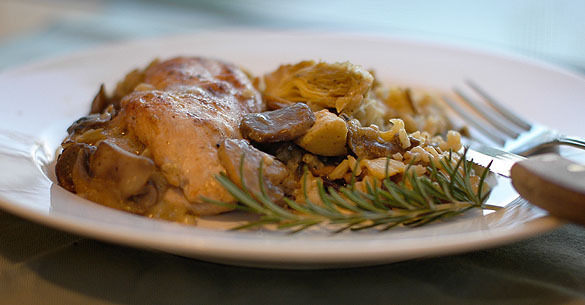 Arrange chicken over rice and top with artichokes. Spoon sauce and mushrooms over the chicken and artichokes. Cover with aluminum foil and bake until thoroughly heated, about 50 minutes. Let stand for 5 minutes before serving. YUMMMM! That sounds sooo good. And my local store just had a sale on artichoke hearts! Hank sounds interesting. Can’t wait to hear more about him. whoppee — two of my favorites ingredients: chicken and artichokes. Nice to see something with rice instead of pasta. Looks great – can’t wait to try it. Mmmmm! This sound deeelish! Kind of reminds me of Chicken Angelo if you swapped the rice out for potatoes. I will be making this right away. Yum! Anything with artichokes and mushrooms is right up my alley. Hmmm…last time I tried cooking with canned artichokes, I was a little disappointed. HOWEVER, this sounds delish and I’ll now reconsider! Wonder if roasted artichokes would work…? Never had rosemary with artichokes before — will have to try this soon! This looks delicious. I am definitely going to try this out. By the way, you take really nice photos. hi caryn, mmm rosemary, chicken and mushrooms. the three marry so well together. i love the photo. That is a great looking recipe, I would wonder if you can substitute to reduce the salt and fat, (not that its for me). Working in some avacado would also make it just my style! The chicken made this way tastes very delicious. Thank you for sharing this wonderful recipe with me. Wonderful blog ,and magnificent photos.This recipe looks delicius,whith one of my favorite ingredients…artichoke hearts! It looks and sounds great…I can’t wait to try it! This just makes me so happy. I love artichoke! And it goes perfect with greatly seasoned chicken. Mmmm, wow, this dish looks great. Two of my favorite things. Press the “Download Now” button to download OBD Auto Doctor license. Hello! Уверена выбор мебели очень даже не простой. Повально кустарные шараги. А цена всё равно существенная. Посоветуйте где как правило покупаете мебель? Мои родители любят в “Ладье” покупать мебель. В Ярославле магазин “Ладья” уже очнь давно. Есть ли аналоги или может что-то лучшее?